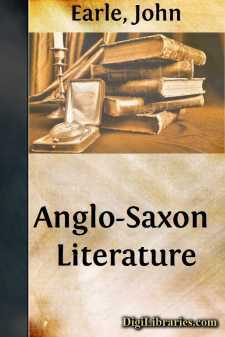 Anglo-Saxon literature is the oldest of the vernacular literatures of modern Europe; and it is a consequence of this that its relations with Latin literature have been the closest. All the vernacular literatures have been influenced by the Latin, but of Anglo-Saxon literature alone can it be said that it has been subjected to no other influence. This literature was nursed by, and gradually rose out of, Latin culture; and this is true not only of those portions which were translated or otherwise borrowed from the Latin, but also in some degree even of the native elements of poetry and laws. These were not, indeed, derived from Latin sources, but it was through Latin culture that those habits and facilities were acquired which made their literary production possible. In the Anglo-Saxon period there was no other influential literature in the West except the Latin. Greek literature had long ago retired to the East. The traces of Greek upon Anglo-Saxon literature are rare and superficial. Practically the one external influence with which we shall have to reckon is that of Latin literature, and as the points of contact with this literature are numerous, it will be convenient to say something of the Latin literature in a preliminary sketch. The Latin literature with which we are best acquainted was the result of study and imitation of Greek literature. But the old vernacular Latin was a homely and simple speech, much more like any modern language in its ways and movements than would be supposed by those who only know classical Latin. The old Latin poetry was rhythmical, and fond of alliteration. Such was the native song of the Italian Camenæ, unlike the æsthetic poetry of the classical age, with its metres borrowed from the Greek Muses. The old Latin poetry was like the Saxon, in so far as it was rhythmical and not metrical; but unlike it in this, that the Latin alliteration was only a vague pleasure of recurrent sound, and it had not become a structural agency like the alliteration of Saxon poetry. The book through which juvenile students usually get some taste of old Latin is Terence, in whose plays, though they are from Greek originals, something is heard of that rippling movement which has lived through the ages and still survives in Italian conversation. Reaching backwards from Terence we come to Plautus and Ennius, and then to Nævius (B.C. 274-202), who composed an epic on the first Punic war. He lamented even in his time the Grecising of his mother-tongue. He wrote an epitaph upon himself, to say that if immortals could weep for mortals, the Camenæ might well weep for Nævius, the last representative of the Latin language. The splendour of classical Latin was short-lived. The time of its highest elevation is called the Golden Age, of which the early period is marked by the names of Cicero and Cæsar; the latter (the Augustan period) by the names of Virgil and Horace. There is a fine forward movement in Cicero, who studied the best Greek models; but gradually there came in a taste for curious felicity suggested by the secondary Greek literature. This adorned the poetry of Virgil; but when it began to spread to the prose, though the æsthetic effect might be beautiful in a masterpiece, it was apt to be embarrassing in weaker hands. Æsthetic prose appears in its most intense and most perfect form in Tacitus, the great historian of the Silver Age. As new tastes and fashions grew, the oldest and purest models were neglected, and, however strange it may sound, Cicero and Cæsar were antiquated long before the end of the first century.